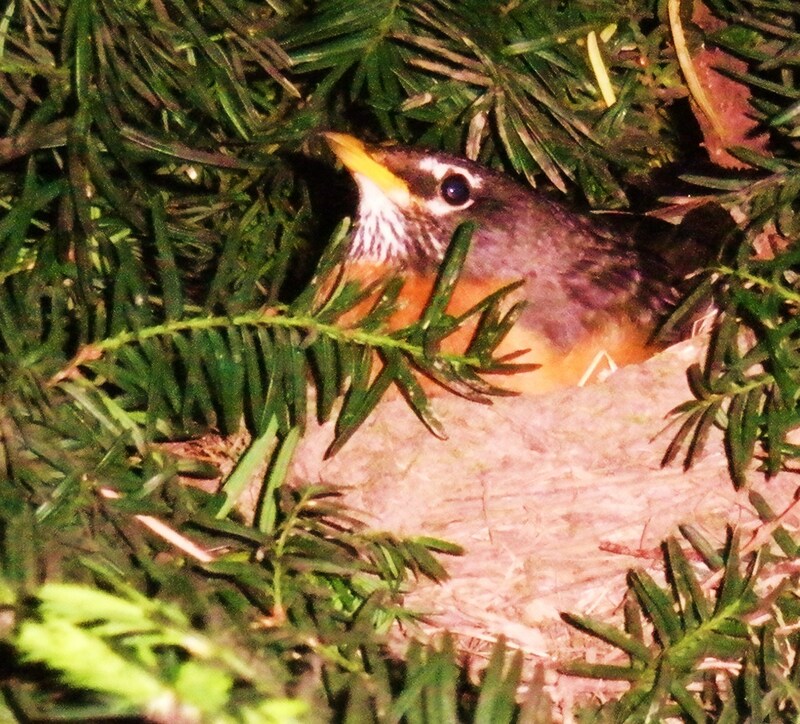 For several years we enjoyed birds nesting in a bush in front of our porch. What a joy to discover a little tangle of leaves, twigs and mud appearing, growing larger each day until a nest was recognizable. Birds are wonderful builders and watching them make a home for their brood is fascinating. 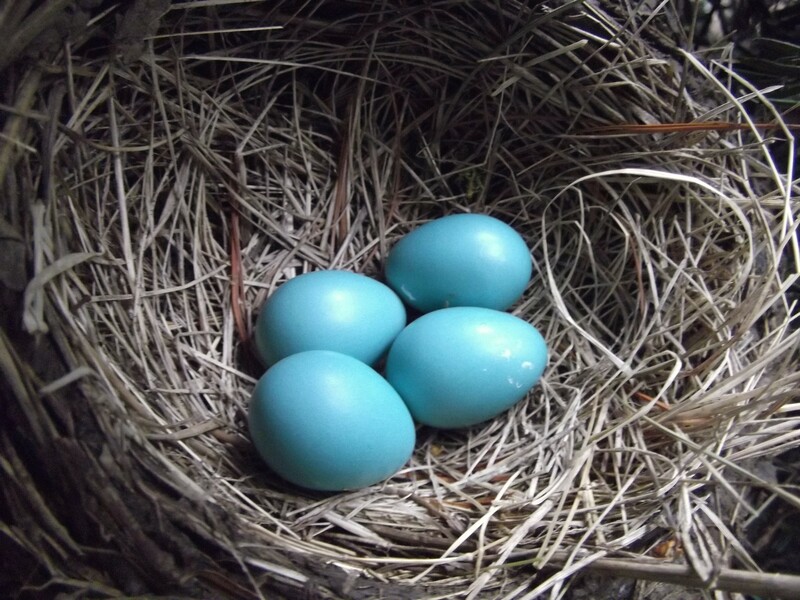 Once the nest was completed, the eggs began to appear, little vessels of sky blue holding the transpiring miracle of albumen and life. Mama Robin would deposit one egg per day until the nest was full of the four she ultimately laid there. Watching her on the nest and waiting for the eggs to hatch was riveting for me and I stalked the bush and the nest with camera in hand and childlike anticipation of the coming baby-bird parade. Several times each day I would go out to inspect the nest and see whether Mama Robin was sitting on the eggs or gone to find some food for herself. When the eggs hatched I happened to catch the process as it unfolded. The miracle of birth! I had just said goodbye to Jeff as he left for work that morning, and it was a day off for me, so I checked the nest and one of the little babies was pecking its way through the shell right before my eyes. I was bolted to the spot as I beheld this spectacle of one tiny bird, then its nest-mates, fighting to be born. My daily obsession continued as I followed their growth and progress, listening to the wails of hungry infant birds, watching Mama Robin as she took such expert care of her little family. This was great stuff! And I knew that before long the babies would leave the nest and fill my dogwood tree with birdsong and flight. 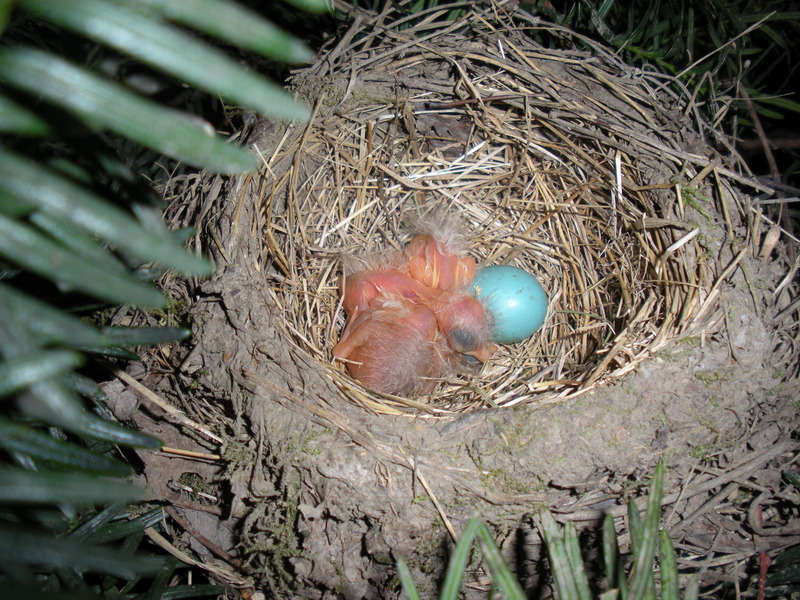 A new robin’s nest appeared the following year…but so did a neighborhood cat, who demolished the nest and the eggs. leaving behind only the empty nest with a broken shell to remind me that life is fragile and nothing is promised. Nature is not always kind. 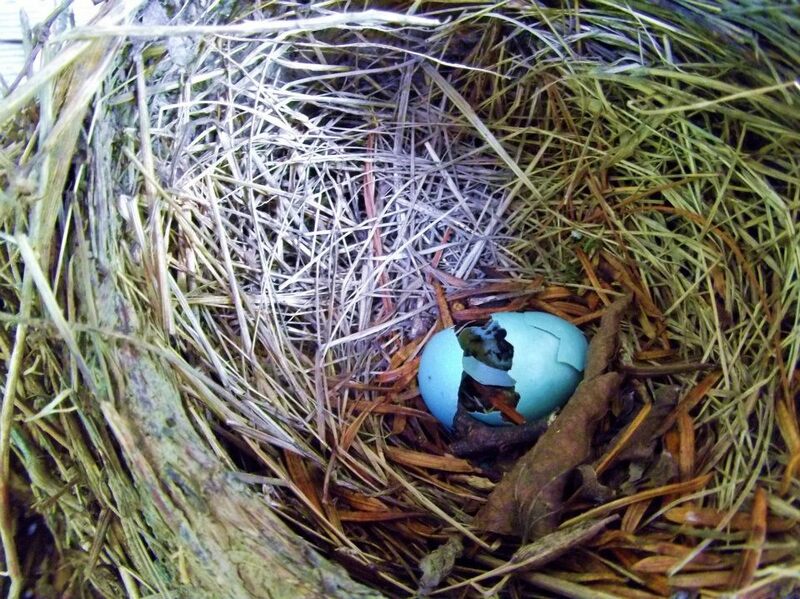 Like the shell of a robin’s egg, sometimes we have to be broken in order for a new thing to be born. Jesus talked about wheat dying in the ground in order to sprout and grow grain. Caterpillars have to break through the chrysalis to spread their new butterfly wings and fulfill their destiny. Brokenness is a hard thing, a painful thing. And sometimes it is a needed thing. Lord, when I am broken, remind me that it’s not forever…and that it is for something new to be born.